The Molino Tejada offers an idyllic enclave, in a lost valley, where silence is heard and the whisper of the Ebro inspires. It is a perfect nest for ideas where innovative projects are born and developed. Your destination for Teambuilding. "River Ebro, River Ebro, in spring days, when an early breeze wakes the flowers and aromas, on your quiet shores ..."
Wake up to the sound of silence and stroll along green pastures. This is Molino Tejada, a haven of peace in pastoral lands, a bucolic Cantabrian place ideal for creation. 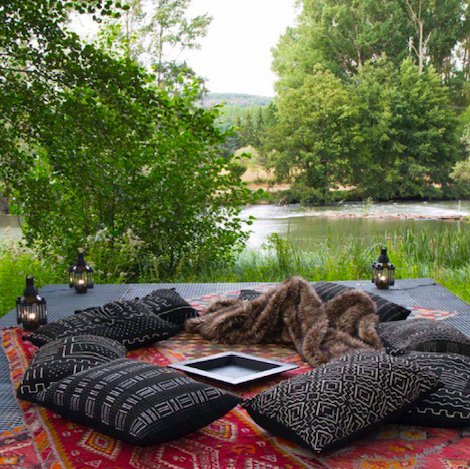 Host meetings in the Water Room with the Ebro River running under your feet, have a morning coffee as you sit on the river bank, and have dinner under the stars with the Peña Camesía as your witness. Taste fruits and vegetables from our garden, ride a bicycle or visit the architectural gems of Romanesque art. All pure inspiration. Can you imagine an a retreat like this with your team? Take your team away from the world, where you will be surrounded by peace and nobody will bother you. You can fly in your private jet and land ten minutes from the Mill. There you will find a personal chef and accommodation for 30 people in a magical space. Discover the Valley, its people, and its ancient caves. Take a morning stroll along the river, go by bicycle to nearby towns or hike in the mountains. Clear minds and plan for the future.